Somehow when I’m stressed out, I either sleep way more than I should or I lay in bed for hours, wide awake pondering all my worries. 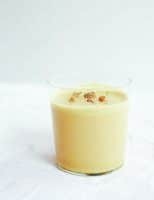 This Hot Chamomile Milk recipe is the perfect warm bedtime elixir to help soothe your nerves so you can fall asleep easier on those nights when you just can’t turn your mind off. Chamomile contains an antioxidant called apigenin, which is thought to bind to brain receptors that help promote sleepiness. Although the recipe calls for dried chamomile flowers, you can use 2 chamomile teabags or 2 tablespoons of loose chamomile tea instead if you have those on hand. 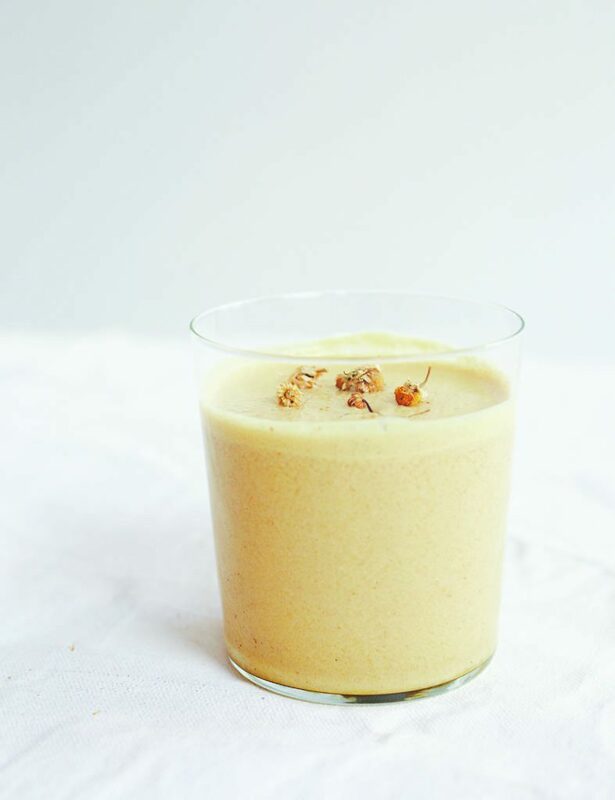 This calming chamomile milk recipe comes from Danielle Copperman’s new book, Well Being: Recipes and Rituals to Realign the Body and Mind. I love that this book is essentially an encyclopedia of all things natural wellness–from food to herbal remedies, DIY beauty to yoga and more. It is amazingly comprehensive and not only that, it’s a beautiful book to thumb through too. If you want to revamp your daily routine, Well Being will be your go-to guidebook. Shared with permission from Danielle Copperman's Well Being: Recipes and Rituals to Realign the Body and Mind; Kyle Books. Set a saucepan over a medium heat and add the almond milk, water, chamomile flowers (or tea), vanilla, honey (if using bee pollen, add later) and any elevational extras. Bring to the boil and then simmer for 5–10 minutes. Strain into a blender, add the linseeds and bee pollen, if using, and blend on a high speed for 30 seconds. Strain and serve hot. I am gonna give this a try tomorrow! Love your recipes!